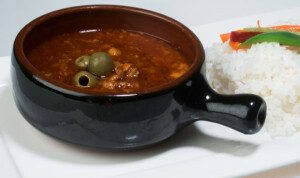 CAZUELA: a clay pot that serves as a vessel for combining ingredients to make sumptuous dishes. It is this cooking container that serves as the inspiration for the newly opened Cazuela restaurant in Sapphire Block, Ortigas. 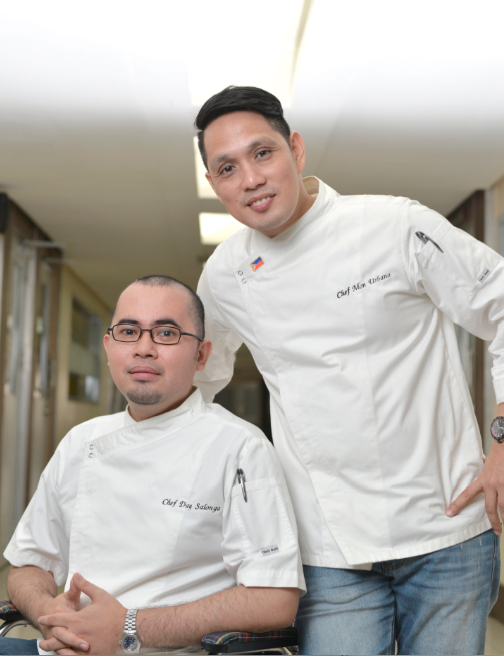 Chefs Mon Urbano and Day Salonga used this idea to present a menu influenced by Spanish culinary traditions. 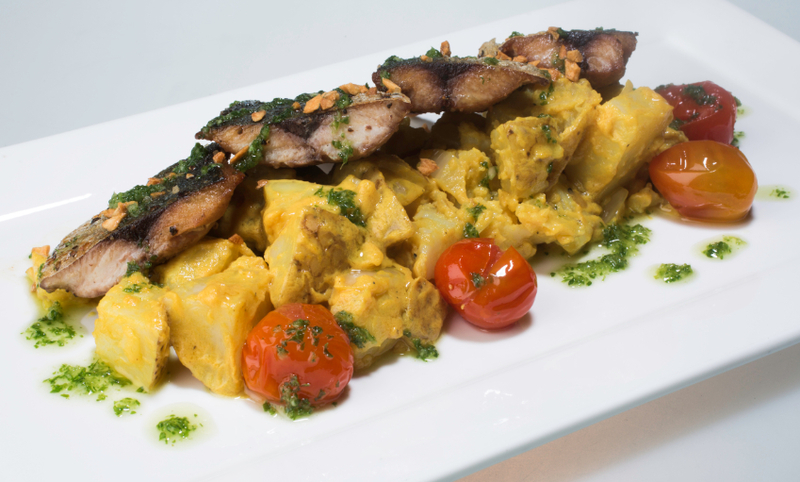 “We want our diners to experience the flavors of the different countries colonized by Spain. We aim to go beyond traditional Spanish fare and to showcase dishes created because of the Spanish galleon trade,” says Chef Day. Chefs Mon Urbano and Day Salonga established MonDay Chefs in 2008, a consultancy company that provides creative solutions and management services to restaurants/food establishments, locally and around the Asian region. The duo owns Ted’s Kitchen, Ted’s Bed and Breakfast, and Ted’s Warehouse Events Space in Santa Cruz, Laguna. They are also part owners of The Commissary Kitchen in Paranaque City. They have authored two books, The Malunggay Cookbook and Make Good Money with Malunggay, both 2013 Gourmand World Cookbooks Award winners. “Spanish Colonial Cuisine is the result of using local ingredients from various countries to produce Spanish flavors,” explains Chef Mon. To further understand the meaning behind this term, a spread of Cazuela’s most popular items was served to an intimate group of media guests during a recent lunch. Ox Tail Estofado—tender bites of stewed Angus ox tail with a red wine sauce—and Lamb Skewers showed the marriage of Spanish and Latin America. The savory stew of Veal Caldereta and Baby Squid al Ajillo redolent with roasted garlic, are definitely influenced by Filipino taste. The delightful Baby Squid al Ajillo, sautéed in roasted garlic- infused olive oil, is a comforting taste of familiar flavors. 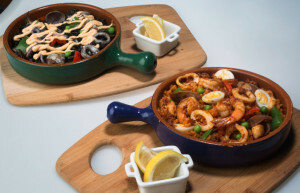 Cazuela’s best-sellers include the Tuna Ceviche, Gambas al Ajillo, Callos, and their Paellas. Pan-seared Mackerel was a flavorful combination of Spanish, Filipino, and North and South American flavors, complemented by the the chimicchurri sauce and potato salad. Cazuela offers tow kinds of Paella: the familiar Paella Negra and Paella Cazuela, their version of Paella Valenciana with chicken, seafood and chorizo. The Callos is reminiscent of the dish that Chef Day grew up with, with no shortcuts and quality ingredients of stewed ox tripe in flavorful tomato sauce. 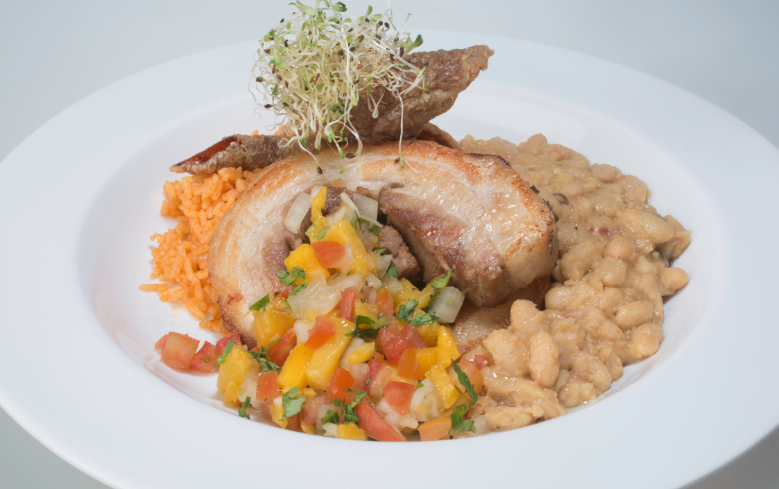 Cerdo al Horno is a wonderful example of Cazuela’s colonial cuisine in one plate. The traditional Spanish dish of 3-hour roasted pork belly stuffed with chorizo de Bilbao is complemented by a refreshing mango salsa (Latin American influence), saffron rice and beans (Mexican influence). 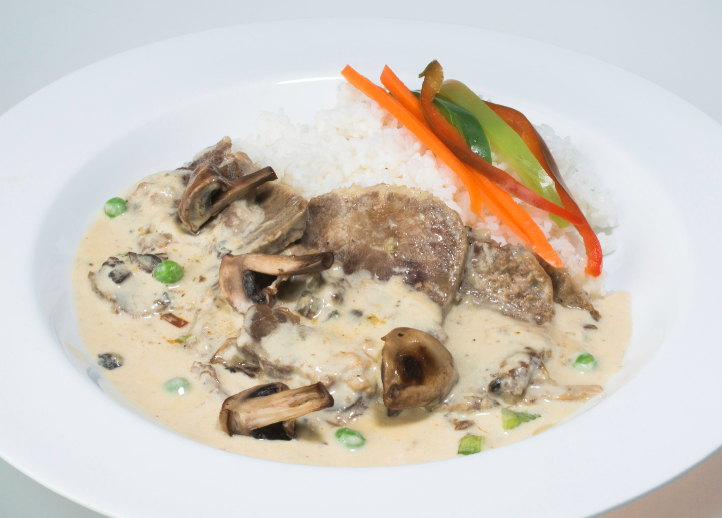 Lengua is another must-have at Cazuela, with its tender ox tongue simmered in a creamy fresh mushroom sauce. The desserts at Cazuela should not be missed, from the Kesong Puti Cheesecake, Gypsy Cake or Churros a la mode. Leave room to indulge in a slice of Kesong Puti Cheesecake, topped with meringue bits and drizzled with salted egg dulce de leche sauce. Pastry Chef Gel Salonga’s Brazo de Fernando otherwise known as Gypsy Cake, was part of Inquirer Lifestyle’s Best Desserts 2015. The light yet decadent version of the Brazo de Mercedes combines chocolate-infused meringue layers with custard, dusted with cocoa powder and finished off with sherry wine for a slight bite at the end. Veering away from the traditional makes Cazuela stand out from the other Spanish restaurants in the metro. 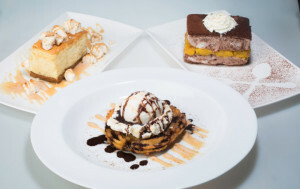 It also allows for a more flexible and extensive menu to satisfy the wide range of diner preferences. From office workers, friends and family, everyone will feel welcome with the diverse menu options available. Special deals abound such as Cazuela’s P799 Wine-All-You-Can promo, which runs every Monday, Wednesday, Friday, and Saturday from 9:00pm to 12:00 midnight. 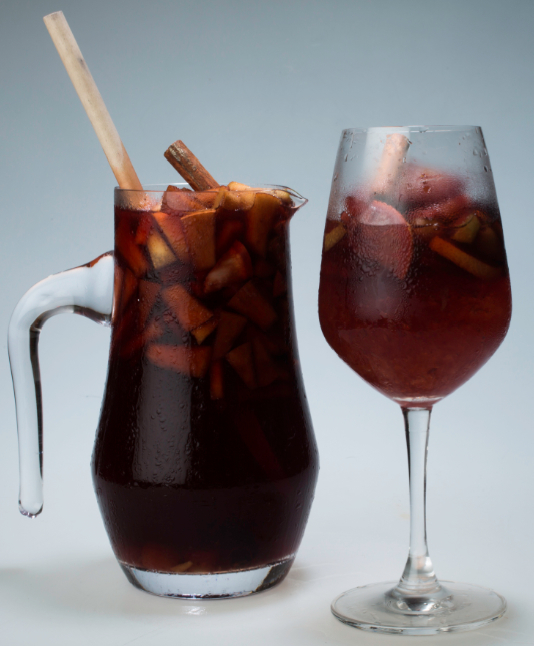 Sangria lovers should drop by every Tuesday, Thursday, and Saturday from 9:00pm to 12:00 midnight to get 50% off their 2nd pitcher. From 10:00pm onwards, guests can order after-party chow of Angusilog (made from certified Angus beef tapa), Brown Rice Arroz Caldo, Homemade Garlic Chorizo, and Tapang Waterbuffalo (Carabao). Cazuela sets the right tone, with its vibrant interiors. Bright paintings adorn the walls and patches of colorful Machuca tiles add detailed touches – as creative enhancements of the floor-to-ceiling wine shelves and as embellishments on the cement-based finish of the flooring. 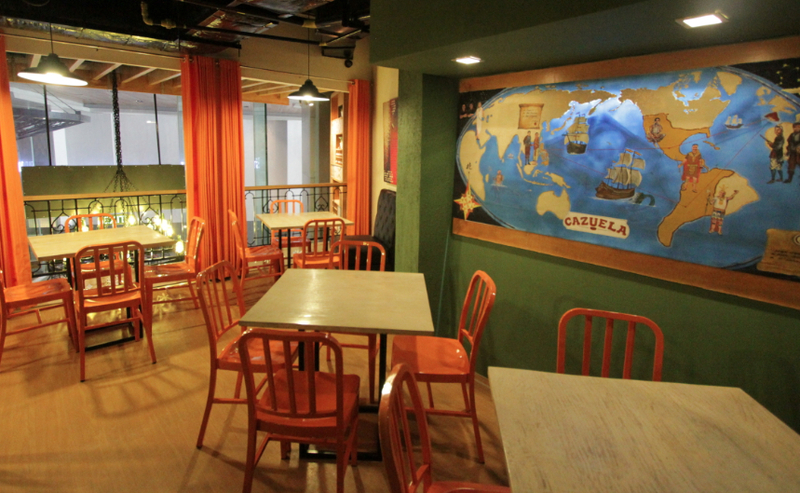 Cazuela is a comforting haven in the Sapphire Block building. The wrought iron chandeliers with wine bottle lamps add a little whimsy to the venue while the black leather couches and soft orange curtains emphasize its coziness. 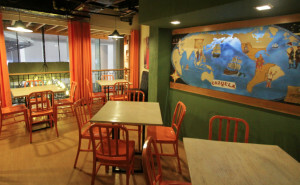 “This was a collaboration of the owners with Interior Designers Vince Subeldia and Louie Khan,” shares Chef Mon. 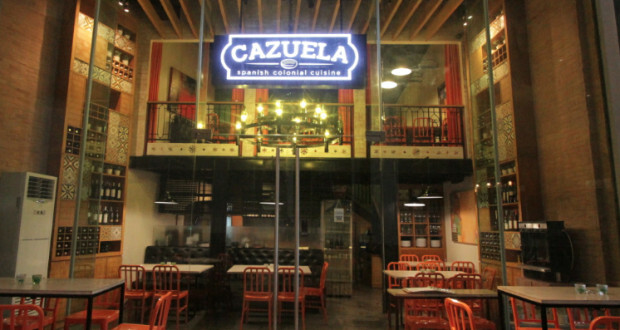 Cazuela is managed and operated by Cazuela JV Corporation, which includes Atty. Gener Sansaet, Marissa Ebdane, and John and Ces Manalo. All the recipes were conceptualized and developed by executive chefs Mon and Day, with the assistance of Sous Chefs Andre Espiritu and Cristina So.